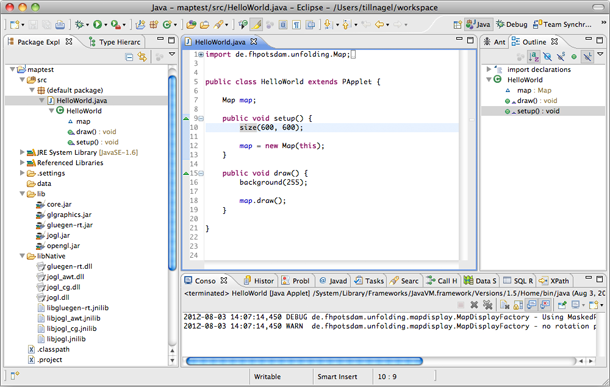 How-to set up the Unfolding library in Eclipse, and how-to create your first simple map in minutes. Download the Unfolding template for Eclipse and extract it to your workspace. In Eclipse, import it as an existing project. Lastly, select the native library for OpenGL for your platform. For this, go to “Configure Build Path”, select the jogl.jar, edit the Native Library location, and select the appropriate directory for your OS. Now, you should have a fully working Java project with the unfolding.jar and all other necessary libraries. Let’s begin with the most basic Processing sketch. Here, we simply extend Processing’s core class PApplet, and implement the setup() and draw() methods. Now, let’s add a map. For this, we need to create an UnfoldingMap, and draw it in the drawing-loop. Run the program and you’ll see a world map with our default style in full-size. Now you can use the full API of Unfolding. As an example, let’s jump to a specific location, and make the map interactive. // Show map around the location in the given zoom level. This gives the application 1GB of memory from the start-up. Of course, you can use any memory settings appropriate to your application and hardware setup. If you haven’t used Eclipse before, you might want to read a bit about it. See for example Learning how to use Processing in Eclipse.